At Absolute Steel we are ready to help you begin your metal roofing installation. The first step is an accurate panel cut list. We use our own proprietary software to arrive at a detailed quote which includes all cuts (assuming the quote is for vertical panel roofing), panel layout, all appropriate trim pieces, panel screws, roof vents—completely everything you will require for the job…provided we are furnished with the correct information. Now, we don’t need a detailed architectural drawing (if you do happen to have one that’s great but double check its accuracy) and it doesn’t have to be to scale so don’t worry about that. We have examples of two of the most common roof styles below. 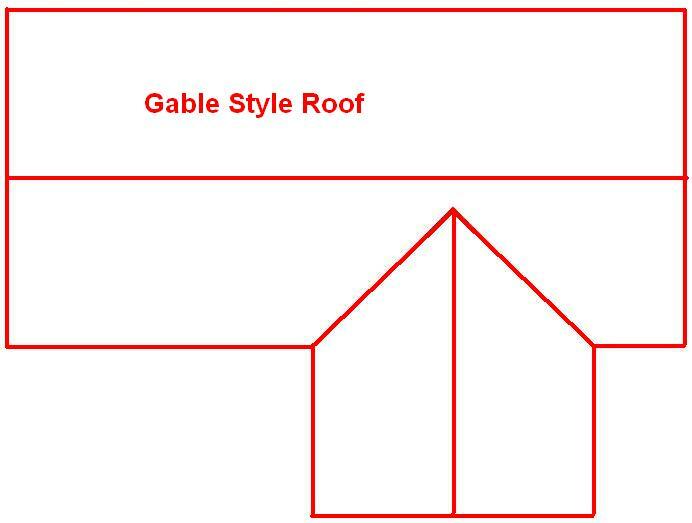 The hip style roof is in blue and the gable style roof is in red. Select the style that best matches your project and move on to step 1. Step 1: Roughly draw out your roof on a piece of paper. Remember, it doesn’t have to be to scale or look pretty. It does have to contain all the straight lines of your roof and an accurate measurement of those lines. For example, what we need on the picture of the roofs below are measurements of all the blue or red lines. Draw in a fireplace if you have one with its measurements and/or roof vents and the diameter of each one. Step 3: Now, either fax that to 480-768-1514 or put it in PDF format and e-mail it to us using our online contact form. You can even use snail mail if you want.